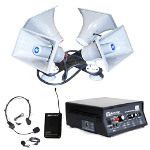 Take your message on the road, projecting your voice and music from your car, truck, boat, or any other automobile. 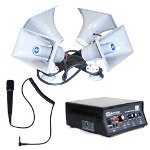 The horn PA systems are securely mounted to the roof of your vehicle with straps and suction cups. Quick to install and setup in four easy steps, the car PA systems are simple to use yet powerful in design. 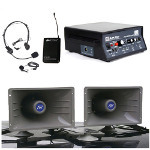 Loudspeaker systems feature a wired or wireless microphone as well as options to project audio from your iPod, CD player, or other audio devices. Weather resistant for the extreme heat or cold, be clearly heard up to a Half-Mile range nearly nine football fields away. Equip any car, truck, bus or boat for voice-casting in minutes. 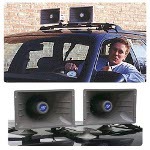 The Car PA Systems are weather resistant for the cold, heat, rain or snow. Twin horns with car-top mounting, built-in wireless receiver with wireless headset & lapel omnidirectional mics. Built-in wireless receiver with wireless headset and lapel mic plus transmitter. DC car adapter and cables included. 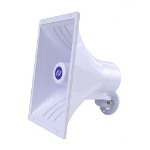 Wide range add-on horn speakers in a variety of mounts: adjustable wall, tripod, stacking and car top in twin or quad-horn.